CHICAGO – In the latest HollywoodChicago.com Hookup: Film, we have 50 pairs of advance-screening movie passes up for grabs to the new horror film “Insidious: The Last Key” from the creative minds behind the hit “Insidious” trilogy! “Insidious: The Last Key,” which opens on Jan. 5, 2018 and is rated “PG-13,” stars Lin Shaye, Leigh Whannell, Angus Sampson, Kirk Acevedo, Caitlin Gerard and Spencer Locke from writer Leigh Whannell, director Adam Robitel and producers Oren Peli and Jason Blum. To win your free passes to “Insidious: The Last Key” courtesy of HollywoodChicago.com, just get interactive with our social media widget below. That’s it! This screening is on Wednesday, Jan. 3, 2018 at 7 p.m. in downtown Chicago. The more social actions you complete, the more points you score and the higher yours odds of winning! Completing these social actions only increases your odds of winning; this doesn’t intensify your competition! Deadline: Entries can continue being submitted through Wednesday, Jan. 3, 2018 at 9 a.m. CST. These Hookup winners will be awarded via e-mail on that date. 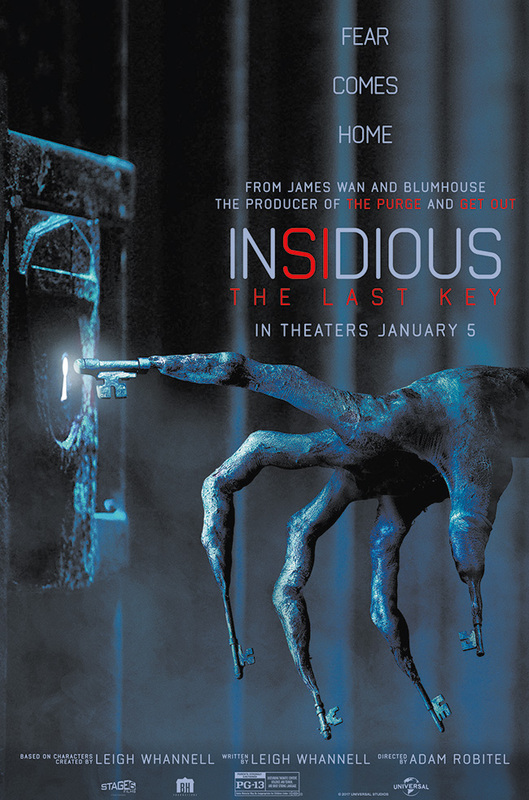 The creative minds behind the hit “Insidious” trilogy return for “Insidious: The Last Key”. In the supernatural thriller, which welcomes back franchise standout Lin Shaye as Dr. Elise Rainier, the brilliant parapsychologist faces her most fearsome and personal haunting yet: in her own family home. The film is written by co-creator Leigh Whannell (“Saw”), who wrote the trilogy and directed “Insidious: Chapter 3”; produced by “Insidious” regulars Jason Blum (“The Purge” series, “Get Out”), Oren Peli (“Paranormal Activity”) and co-creator James Wan (“The Conjuring,” “Furious 7”); and directed by series newcomer Adam Robitel (“The Taking of Deborah Logan”). Shaye is joined in the cast by Angus Sampson, Whannell, Josh Stewart, Caitlin Gerard, Kirk Acevedo, Javier Botet, Bruce Davison, Spencer Locke, Tessa Ferrer, Ava Kolker and Marcus Henderson. Steven Schneider, Brian Kavanaugh-Jones, Charles Layton, Bailey Conway Anglewicz, Couper Samuelson and Whannell serve as executive producers. The movie poster for “Insidious: The Last Key” from the creative minds behind the hit “Insidious” trilogy. This HollywoodChicago.com Hookup is simple! Just get interactive in our social media widget above. We will award 50 admit-two movie tickets based on social entry numbers and/or randomly via e-mail for our “Insidious: The Last Key” Hookup. Good luck!